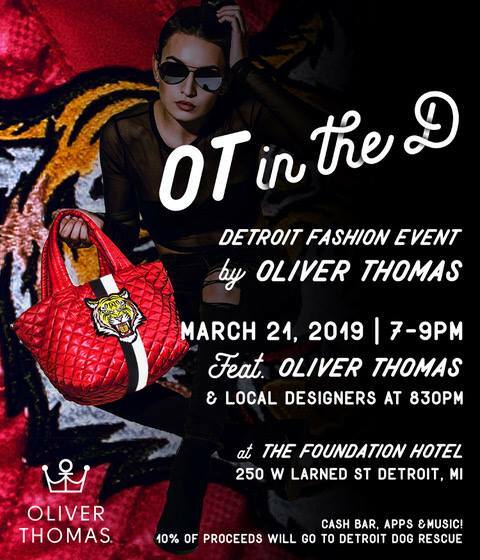 Michigan based handbag brand, Oliver Thomas is having a party in the D. Join us for OT in the D for a live fashion show, music, cocktails, fashionable networking and a great night celebrating Detroit and Oliver Thomas. The event will run 7:00 p.m. – 9:00 p.m. at The Detroit Foundation Hotel downtown Detroit on Thursday, March 21, 2019. Oliver Thomas was named after a dog. It’s true! He’s quite adorable, and for a brand that never played by the fashion industry’s standard rules, to begin with, we think he makes a cool ambassador. Will he make an appearance at the party? You just may have to show up to see for yourself. “Nobody needs another bag. Nobody really needs another anything. But we want stuff sometimes, and there’s nothing wrong with that. We won’t try to sell you on the fact that our bags will make your legs or weekends longer. They won’t. They will make neither your booty nor life story juicier. Our bags carry stuff. Not self-worth.” – OT. We look forward to seeing you Thursday, March 21st!